Real progressives need more than labels and brands to engender enthusiasm. There's a hilarious new product coming soon to your Costco store shelves. It's called Batter Blaster™; and, according to its web site, "it makes organic light and fluffy pancakes and light and crisp waffles in minutes!" 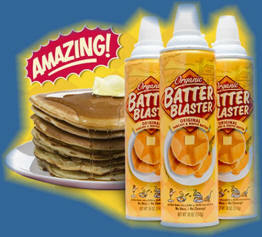 Batter Blaster was drawn to my attention by an associate at work, who messaged me: "do you like pancakes and waffles? especially when camping?" "Sure," I responded. He then sent me the above link to the Batter Blaster home page. My very, very, first thought was that this was an awesome idea. Backpacking breakfasts are an issue, because at no time is breakfast more the most important meal of the day, than when that day is going to consist of carrying all of one's gear over miles of countryside to the next campsite, or even back to one's car. But then I got to thinking. The metal cans in which the product is packaged aren't very lightweight. Nor are they very "green". In fact, it's kind of missing the point to put out an organic product in a non-biodegradable package, isn't it? Like many progressives, I had deep hopes for Obama. For one thing, and I know it isn't too "PC" to say, he's black. My general feeling is, we've given rich white men over two centuries to get things right, and look at the result. Let's elect someone black, or female, or poor, and surely the results will be, at the least, different. And, maybe even, better? Obama also began his campaign with an anti-war position; and that's a plus. As a gay man, I've felt I had a special appreciation for the black person's struggle for equality. After all, this is a struggle we share, the only difference being that I can choose to pretend to be straight, while few blacks can successfully pretend to be white. And since the black community traditionally disapproves of those "passing" as white, I've always figured its members would certainly understand why I, and other gay people, would find the idea of "passing" as straight—for those who can do it—abhorrent. And so, it was quite disturbing to me that last week, Senator Obama, in a campaign fund-raiser, got Gospel singer Donnie McClurkin to perform. McClurkin is a somewhat famous "ex-gay" who describes other gays—the not "ex" kind—as people who "kill our children". Now, I have nothing personal against people who are so filled with self-loathing they give themselves electric shocks in an attempt to change the way God made them. I figure, they are punishing themselves more than I ever could. But to appear on the stage with a Presidential candidate is to give them far more legitimacy than they deserve. Obama's reply was to state he believes in getting people of all points of view to speak to each other. That's a noble goal; but I notice it was a gay-basher and not a Middle-Eastern terrorist or member of the KKK he invited onto the stage with him. 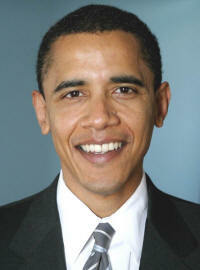 And that the audience, according to Obama's own explanation, tends to be homophobic because they are African-American. What??! Who's being racist, now? In fact, fairly recently, Obama came down hard on a member of the Bush Administration that foolishly made some non-PC statement. Apparently it's notokay to give a platform to those speaking against blacks; only those speaking against gays. Batter Blaster, according to its label and its web site, must be refrigerated. That pretty much eliminates its use as camping food. In fact, my recommendation is that you take a plastic jug with lid, fill with a measured amount of "complete" pancake mix. Then all you have to do at the campsite is add water. No refrigeration needed, less weight, and no waste. What seems to have happened with Batter Blaster, the thing that makes it so hilarious, is that the inventors apparently said, "Hey, if we put organic ingredients in the can, we can sell to people who like convenience and to people who want to eat healthy!" It apparently didn't occur to them that people who want to eat healthy today, are usually the same people who want our children to have a clean Earth tomorrow. With Barack Obama, it's as if his campaign managers said, "Okay, so you're an anti-war progressive. Now, all we have to do is add a little homophobia in there, and we'll get the Fundamentalist Christians, too!" Sometimes something that seems like a new and wonderful idea, turns out to be the same old stuff mixed with a spiffy package that isn't as suitable for the task as the original product. I'm afraid that's true of both Batter Blaster and Barack Obama.